ÉAMON LILLIS is fighting to cling to his share of a French villa where he holidayed with his wife, Celine Cawley, just weeks before he bludgeoned her to death. 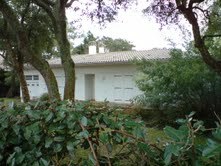 The property at Hossegor on France’s south-west coast was bought in around 2005 and was once valued at about €800,000. It appeared to be jointly owned by Miss Cawley’s father James and Lillis, who is serving a six-year manslaughter sentence in Wheatfield Prison. He beat his wife to death with a brick at their home in Howth in December 2008. In March, a French court will hear an application by Miss Cawley’s sister Susanna and brother Christopher to have the property’s ownership transferred to Lillis’s 18-year-old daughter – and only child – Georgia. The hearing, at Dax High Court, is the latest in a string of legal moves by Miss Cawley’s family to prevent Lillis from benefiting from his wife’s estate. That fight hit a setback earlier this month when the High Court in Dublin ruled he is entitled to half of her assets. Then, his daughter had said she would rather stick pins in her eyes than accept her father’s right to return to live within even a few miles of the house where he killed her mother. Assets the couple owned jointly included their €800,000 Howth home, a €200,000 Sutton apartment and €68,000 in investments. However, because of his conviction, he is not entitled to inherit any property that his wife owned in her own right. Her family have long contended he should have no rights whatsoever to any property – jointly owned or otherwise. The French villa sleeps eight and was due to be rented for summer 2009 at about €3,000 a week. Complete with swimming pool, it is just five minutes from the sea in an affluent district of the popular surfing resort. Neighbour Christian Vergez, who lives on the same secluded tree-lined avenue as the disputed property, remembered Miss Cawley with fondness when interviewed in 2008. He said: ‘When they first moved in, we had a drink at our house with her and her husband, and they invited us back. ‘They were not there very often and nor are we. We did not see each other very much but we know them to say hello and chat over the hedge. We saw them this summer. ‘She was full of vitality and energy. A strong woman. ‘She told us she had been here (to Hossegor) when she was younger, about 30 years ago.’ According to a neighbour living near the holiday villa, Miss Cawley had been planning to enrol Georgia at a school at the small town of Hossegor, 180km south of Bordeaux.